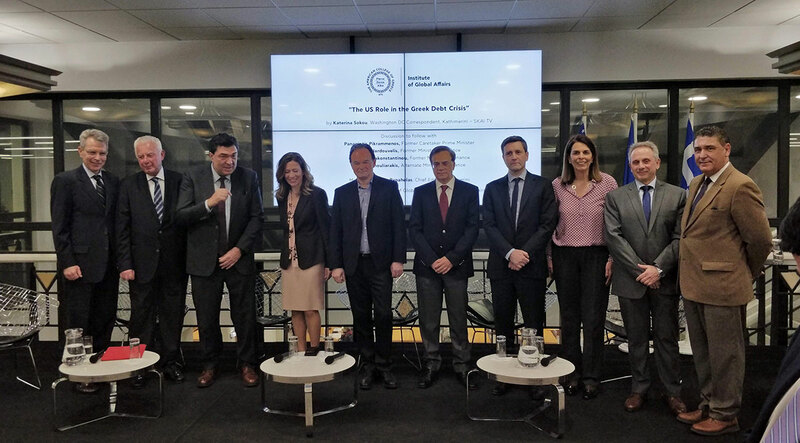 On Wednesday, March 6, distinguished guests from the Greek political and journalistic world came together at the Upper Level Library to attend an event organized by the ACG Institute of Global Affairs and hosted by Washington DC correspondent for Kathimerini – SKAI TV, Ms. Katerina Sokou. The presentation, themed “The US Role in the Greek debt crisis”, featured high-profile guest speakers, Messrs Panagiotis Pikrammenos, Former Caretaker Prime Minister; Gikas Hardouvelis, Former Minister of Finance; George Papakonstantinou, Former Minister of Finance; and George Chouliarakis, Alternate Minister of Finance. Mr. Alexis Papahelas, Editor in Chief of Kathimerini, moderated the panel discussion that ensued. The event was honored by the presence of H.E. US Ambassador to the Hellenic Republic, Mr. Geoffrey R. Pyatt. 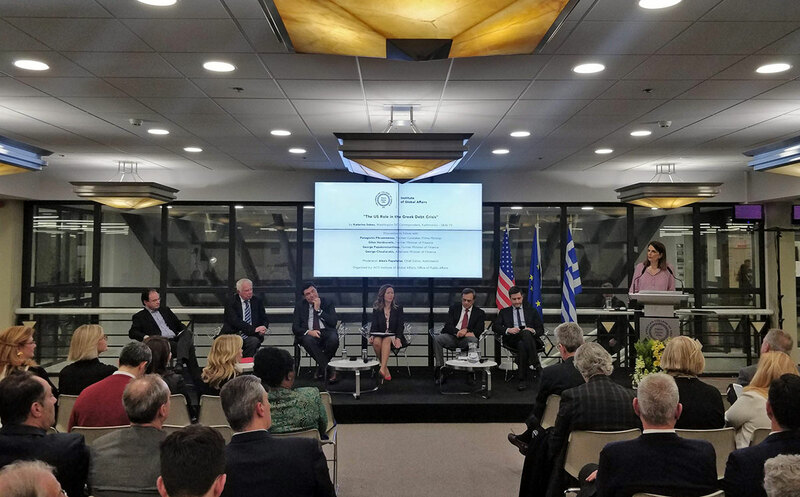 Based on interviews from Greek, American and European officials, Ms. Sokou’s research elaborated on the crucial role the US played throughout the Greek debt crisis. Preventing contagion, preserving geopolitical stability in the region, keeping Greece in the Eurozone, reforming the country’s economy, restructuring part of the Greek debt were some of the top priorities for the US at the height of the crisis. Moreover, US actions had a stabilizing effect for Greece at critical times in 2010, 2012 and in the eventful summer of 2015. US diplomatic efforts were consistent and took many different channels on several occasions, said Ms. Sokou in her analysis, highlighting the unpredictable implications of a potential Grexit for the whole European project. In the discussion that followed, the guest speakers acknowledged the US contribution and shared personal experiences from that period. Former Caretaker Prime Minister Mr. Pikrammenos, in particular, disclosed unknown details of a letter he had sent to President Barack Obama prior to the Greek national elections of June 2012, asking for American intervention to prevent the imposition of capital controls. Commenting on the role of The American College of Greece during this hard decade, Vice President of Public Affairs Ms. Claudia Carydis cited examples of the many ways ACG is helping Greece grow, such as the expansive financial assistance and scholarship program, parallel studies, internships, partnerships, and more. “More than 50% of our students are receiving some sort of financial assistance so that they can study with us. Just in the year 2018, a total of 6.4 million Euros were given for the academic support of ACG students of all divisions” noted VP Carydis and went on to mention the institution’s long-term strategic goals, namely the “ACG 150 | Advancing the Legacy, Growing Greece” plan to leverage education for economic and social impact that will guide the College’s operations through 2025, its 150th anniversary.